Professor Konrad Jamrozik was Head of the School of Population Health and Clinical Practice at the University of Adelaide and was a tireless campaigner against smoking. Konrad's first interests in tobacco control began as a young medical intern at the Royal Hobart Hospital during the late 1970s, where he became acutely aware of the dangerous consequences of smoking and the impact it was having on patients. Konrad had entered medical school at the University of Adelaide at age 16, having grown up in the Adelaide Hills where he attended Belair Primary School and Blackwood High School. He transferred to the University of Tasmania when his family relocated to Hobart. Having been awarded a prestigious four-year Nufﬁeld Dominions Fellowship to study at Oxford University, Konrad completed a DPhil (PhD), examining various strategies for the promotion of the cessation of smoking in general practice. Following Oxford, he was appointed as Lecturer in Community Medicine at the University of Papua New Guinea in Port Moresby, where he was also a clinical assistant on the leprosy service. He moved to the University of Western Australia in mid-1984 to take up a research fellowship in the Unit of Clinical Epidemiology. He subsequently held lectureships in medicine and in public health at the University of Western Australia and was promoted to Professor of Public Health at UWA early in 2000. From December 2000 until September 2004 he held the Chair in Primary Care Epidemiology at Imperial College, London. 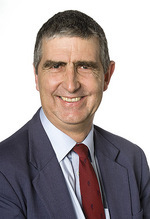 He then moved to Brisbane as Professor of Evidence-based Health Care at the University of Queensland, then in 2007 to the University of Adelaide where he took the role as Head of the School of Population Health and Clinical Practice. Since the mid-1980s, Konrad combined his academic and clinical work with his passion for tobacco control, as a part-time activist but full-time advocate. His approach to advocacy was both opportunistic and unrelenting - "like water dripping on a stone... you never know which drip will crack it". As an academic expert he generated significant new evidence on the impact of smoking on vascular disease, particularly on stroke, and analysed the evidence as a member of numerous expert groups including the National Health and Medical Research Council's Second Working Party on Passive Smoking, an enquiry that the tobacco industry found so threatening they sought to gag its members through legal action. Konrad was an outstanding and proliﬁc researcher, contributing more than 280 research papers to the scientiﬁc literature on areas as diverse as stroke prevention, medical ethics, clinical trials, tobacco control, cardiovascular medicine, breast cancer, men's health and many others. He had wide interests, such as the prevention of vascular disease, procedural care and new strategies in health promotion, and assessing the uptake and impact of the results of clinical trials in day-to-day practice, especially in the area of cancer. In addition to his academic career, which focused on preventing disease, he worked 'at the coalface' as a cancer clinician, helping to treat the cancer cases where prevention efforts had failed. He spent periods working and studying at the World Health Organization in Geneva, Harvard University and in many other places including Uzbekistan. Konrad was awarded Life Membership of the Australian Council on Smoking and Health, the Inaugural President's Award from the National Heart Foundation of Australia and a special Research Assistance grant for Outstanding Teachers from the University of Western Australia. He was a Rowden White Overseas Travelling Fellow of the Royal Australasian College of Physicians and an International Cancer Research Technology Transfer Fellow at the International Agency for Research on Cancer, Lyon, France. He was also a Fellow of the Public Health Association of Australia and winner of the Nigel Gray Medal for outstanding contribution to Tobacco Control. An unforgettable, extraordinary, dedicated man, a loyal and caring friend and colleague with commitment to justice and excellence, he will be sorely missed. One colleague wrote: "It feels like public health in Australia has lost a limb." He was born at Leigh Creek, South Australia, the eldest of three children to parents Adam Jamrozik and Ruth Errey. He died as a result of a sarcoma. He is survived by his wife Lesley and children Zeb, Harriet, Magnus and Aleksander.